The Fair Labor Association reported the results of “the equivalent of a full-body scan” of working conditions at three Chinese factories operated by Apple Inc.’s major supplier Foxconn, and said both companies have pledged to bring their practices up to compliance with Fair Labor code standards. The FLA said its nearly month-long investigation “revealed serious and pressing noncompliances with FLA’s Workplace Code of Conduct, as well as Chinese labor law.” The findings called for a detailed set of remedial measures to protect employee health and safety, reduce worker hours to legal limits while protecting worker pay, and establish “genuine avenues” for workers to provide input on company decisions. Apple joined the FLA earlier this year following intense public attention over allegations of widespread problems at Foxconn, China’s largest private employer. In its report, released March 29, the FLA said its staff had put in 3,000 hours investigating three Foxconn factories and surveying more than 35,000 workers. The probe found that within the last 12 months, all three factories exceeded the FLA standard of 60 hour work weeks (including overtime) and the Chinese legal limits of 40 hours a week and a maximum of 36 hours maximum overtime per month. 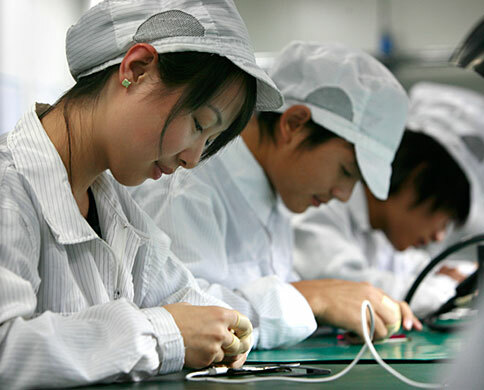 According to FLA’s worker survey, 64 percent of employees said that “compensation does not meet their basic needs.” FLA said it will conduct a cost of living study in Shenzhen and Chengdu to assist Foxconn in determining whether worker salaries meet FLA requirements for basic needs, as well as discretionary income. FLA said it had also observed serious issues in areas such as health and safety, worker integration and communication, treatment of interns, and enrollment in China’s social security system. The FLA report said Foxconn had agreed to revised its compensation packages to make up for the lost overtime, and would hire thousands of additional workers. The agreement likely will ripple through the Chinese electronics assembly sector, Reuters reported. “Apple and Foxconn are obviously the two biggest players in this sector and since they’re teaming up to drive this change, I really do think they set the bar for the rest of the sector,” FLA President Auret van Heerden told Reuters in an interview. The Apple-Foxconn agreement may also raise costs for other manufacturers who contract with the Taiwanese company, including Dell Inc, Hewlett-Packard, Amazon.com Inc, Motorola Mobility Holdings, Nokia Oyj and Sony Corp.
Reuters said the agreement could result in higher prices for consumers, though the impact will be limited because labor costs are only a small fraction of the total cost for most high-tech devices. Ironically, one of the catalysts for the Apple/Foxconn inspections was a widely broadcast radio episode on This American Life repeating the assertions of monologist Mike Daisey that his research had turned up examples of worker exploitation at Foxconn. This American Life later discovered that parts of his material couldn’t be confirmed, and broadcast a lengthy apology.